77 St or 81 Street-Museum of Natural History Station. When you enter the Museum you might be tempted to start at the pieces which are located right at the entrance, in the Byzantine wing. And while this might be the most convenient I would highly recommend you view The vestment from the Vatican first. They are located in the Anna Wintour Costume Center. To reach the Anna Wintour Costume Centre, turn right at the entrance and head into the Egyptian wing and head to Gallery 132. Gallery 132 contains a huge sarcophagus from the early third century B.C. From here head downstairs to the basement of the MET. Many of these garments on display have never left Vatican city. While the exhibit could be thought to be very challenging for the church, the Vatican was actually very amenable to Bolton's ideas. Bolton only requests six pieces but they ended up loaning the MET over 40! The Vatican's only request was that their treasures were exhibited in their own dedicated space, separate from the fashions. 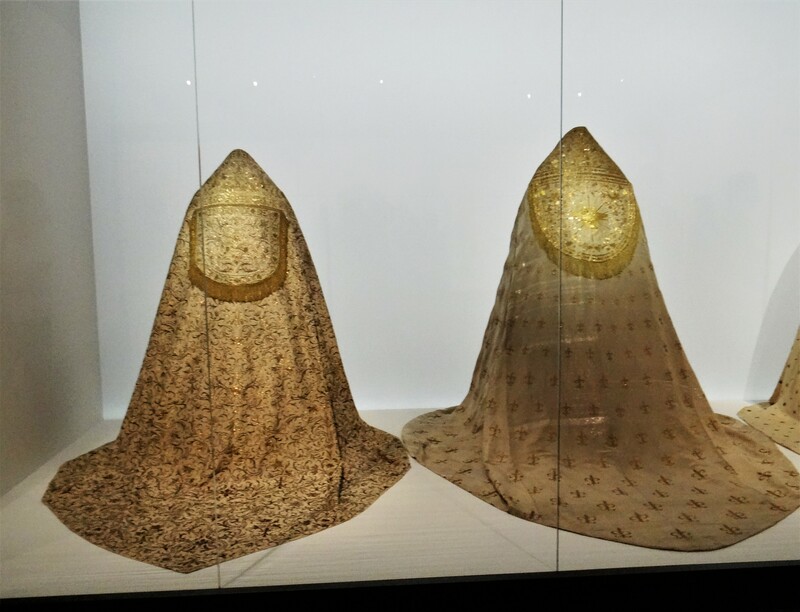 So many of the pieces in the rest of the exhibit could easily be mistaken for real papal robes or religious attire so I can appreciate even simply as a viewer, making a clear distinction between the two. Many of the accessories and vestments are hundreds of years old and predate the fashions by centuries. They provide a great reference for seeing the modern fashion in the rest of the exhibition. The first piece you see in the Vatican Collection, while walking down the stairs, is a stunning Chasuble by Andre Matisse. Bright white satin and silk with green and gold velvet applique decorate the piece. A Chasuble is a garment worn by a Catholic priest during the celebration of Mass. Matisse designed a series of vestments in a variety of colours, each for a different liturgical season of the year. They were originally made for Pope Pius XII. This is the first draft from Matisse since it was too heavy and his subsequent versions were much lighter. He gave this original piece to the MoMA for their permanent collection. Once you enter the main area you'll notice how minimal the entire space is. There are few garments placed in each case and widely spaced out throughout the gallery. Simple grey walls and a minimalist design allows you to focus completely the details of each object. The first on grouping contains items worn by Pope John Paul II. It contains his white and gold vestment which is the tradition papal outfit donned by popes for everyday wear. Featured in the case is also a pair of red slippers designed by Italian cobbler Adriano Stefanelli. The red of the slipper were meant to represent the blood of Christ and other Catholic martyrs but it wasn't the symbolism of the colour which caught people's attention, but their remarkable design. These red slippers instigated a worldwide discussion of the fashion of the Pope as they originally were thought to be made by Prada. Subsequently, the pope made the best-dressed list in Vogue's yearly report. This was perhaps the impetus of the entirety of the exhibition and the discussion around Catholicism and fashion. An interesting thing to note is that although the outfits appear very similar one to each other, almost like a uniform, that in actuality every pope has their own individual style. Some prefer more ornate items like the papal tiaras, other like Pope Francis are interested in a more simple form of dress. It's a kind of humanistic quality we sometimes forget these holy men have. Inside a long glass case in the centre of the room are three incredibly detailed Chasubles. The most impressive of the three is the one made for Pope Pius IX. It took 15 women more than 16 years to hand embroider. Every tiny inch of the embroidery tells a story. It centres around the life of Saint Francis of Assisi. You could spend hours looking at this thing and uncover a different hidden secret every minute. My favourite part is the neckline where you can see the Virgin Mary being welcome into the heaven by saints and angels. 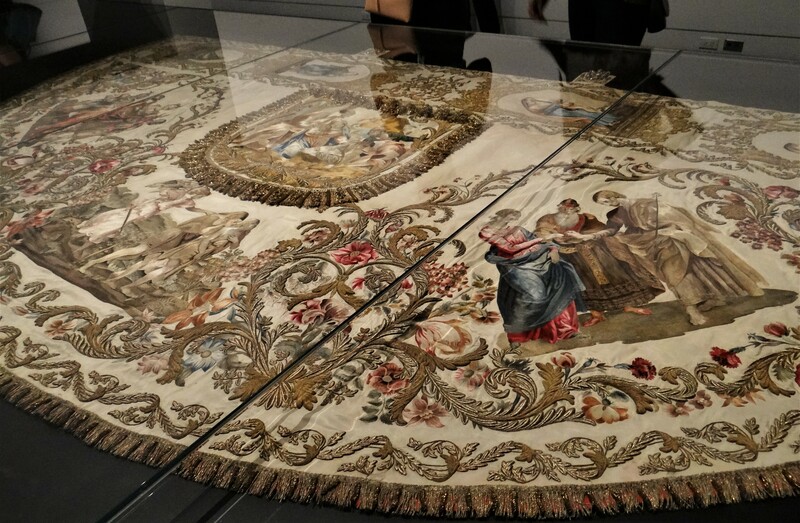 My favourite piece from the collection is the cope of Pius IX from the 1800's. 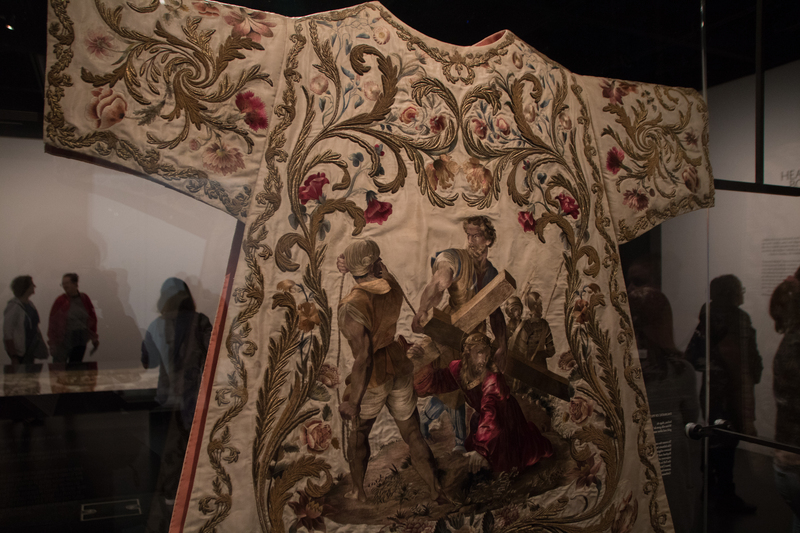 The cope, worn like a cape around the pope's shoulders, features a breathtaking depiction of various scenes from the bible. Each character is so lovingly detailed, the shadows and highlights painted in with needle and thread. The expressions on their faces so powerful. You can understand why wearing this compelling piece of clothing would make the wearer feel supernatural. A series of Dalmatics are also on show. A dalmatic is a long sleeve tunic which clergymen wear during Mass. A series of these dalmatics were created, each for various important moments in the Catholic calendar. These were all created by the Istituto Femminile di Don Nicola Mazza, founded in Verona. The institute taught young girls the skills to create these incredible embroideries, they had three different departments: sericulture, spinning and dyeing, embroidery and one which created artificial flowers. These girls not only faithfully recreated scenes from the bible on the dalmatics but also created stunning botanical designs around the characters. In a small, black-clad room towards the back are glass cases filled with the papal treasures. Tiaras, rings, crosses and Crosiers fill the room, the light reflecting on the incredible gemstones which adorn all the pieces. Most of these precious items were given to the Popes as gifts. The most impressive of all is the three-tiered 19th century Tiara which was given to the pope by Queen Isabelle II of Spain. It containing over 19,000 stones, 18,000 of which are all high-priced diamonds. In various cases are golden Mitres. A mitre is the traditional type of headpiece worn by the certain clergymen in ceremonial settings. The most fascinating one is from 1929, designed for Pius XI, a gift from the prime minister Benito Mussolini. In the centre of the mitre is a silver crucifix and on the bottom the symbols of the evangelist Mark and Luke. It almost looks as if it's a piece of armor the way in which the elements of the embroidery surround the holy symbols. After viewing the papal vestments head back upstairs to the Byzantine Galleries, located to the left and right of the grand staircase after walking into the Great Hall. Every time you look at these modern fashions think about to some of the items you saw in the Vatican collection. How do these papal garments both mirror and inspire? Effect and influence? 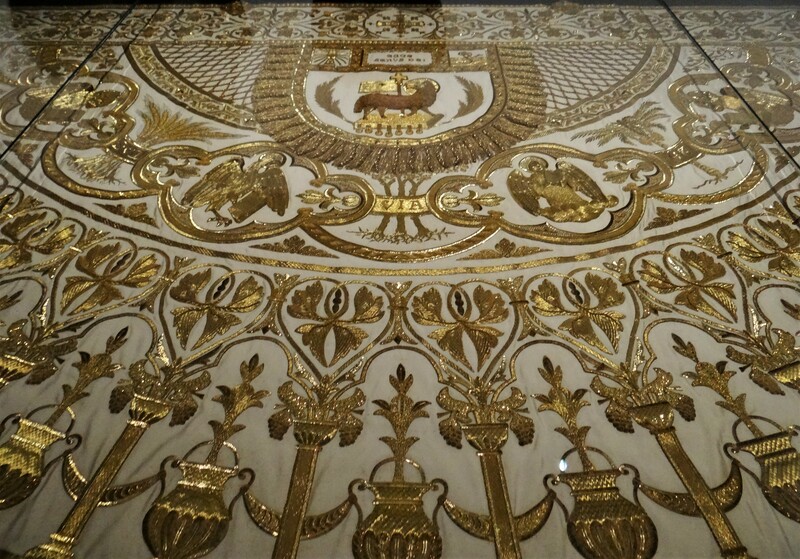 Even if you're not a religious person, looking at these papal vestments is still an awe-inspiring experience.